Ed Dominick and Grant Brittain produced a tribute to The Bones Brigade on The Skateboard Mag site to go along with TSM's Issue #98 which has a Bones Brigade theme to it and the impending release and the documentary by Stacy Peralta. Watch the video on the side. The Search for Animal Chin is a 1987 skateboarding film featuring the Bones Brigade. It is one of the first skateboarding films to have a real "plot" and is considered not only as one of the best skateboarding videos ever made by Stacy Peralta but as one of the video that paved the way for future generations of skate videos. The picture on the left was shot by Grant Brittain on a ramp that was setup in an empty land with no authorization. Fortunately, the crew could make the ramp part without ever being disturbed by the owners. 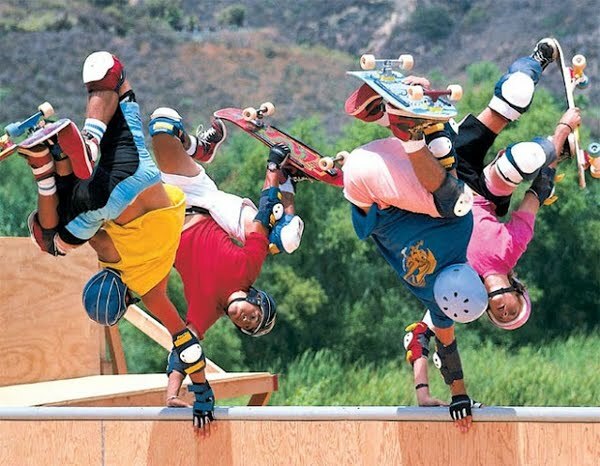 It is one of the most iconic skateboarding pictures ever shoot.